My exact heritage is not recorded, but I�ve been told that my ancestors included the Curly-Coated Retriever and the English Water Spaniel. I am a relatively thick, sturdy dog of rather typical spaniel character. I am friendly, intelligent and personable as well as being an excellent hunting companion. When fully grown, I am between 15 and 18 inches tall (38.1 to 45.7 centimeters) and I weigh between 25 and 45 pounds (11.3 to 20.3 kilograms). We have no American Water Spaniel Breeders listed at this time. 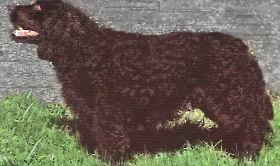 Click here to place your American Water Spaniel Ad!